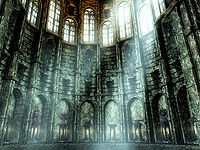 Skyrim is dotted with shrines dedicated to the Divines (including Talos). They are often accompanied by a large statue, although the shrines themselves are obelisks or sculptures small enough to fit on tabletops. They can be activated to receive a blessing, which will cure all diseases and grant a blessing from the specific deity while removing any existing blessing. They are found in the temples within various cities, inside some dungeons, and in unmarked locations throughout the wilderness. Daedric Shrines are listed separately. There is a shrine to each of the Aedra in the Temple of the Divines in Solitude (except a shrine of Talos, which later becomes available if Solitude is taken by Stormcloak forces). Atop the hill directly north of Frostfruit Inn in Rorikstead. Atop a hill northeast of Twilight Sepulcher in Falkreath Hold. Atop another hill northeast of the Atronach Stone and slightly southeast of Steamcrag Camp. Inside Fort Sungard Shrine at Fort Sungard, southeast of Rorikstead. Only present if the fort is occupied by the Legion. At Skyborn Altar if Dragon Rising has not yet been started. Shrine of Arkay Blessing of Arkay: Increases your health by 25 points. Adorning the resting place of an ancient traveler in Wayward Pass. Northeast of Windhelm, south of Snow Veil Sanctum. Disappears if the Empire gains control of Winterhold. (Becomes the Winterhold Stormcloak camp). In the Markarth Hall of the Dead. In the Whiterun Hall of the Dead. In the Riften Hall of the Dead. In the Solitude Hall of the Dead. In the Windhelm Hall of the Dead. In front of the gravekeeper's quarters in Falkreath. Shrine of AurielDG Blessing of Auriel: You are 10% more effective with missile weapons. In Darkfall Cave, at Knight-Paladin Gelebor's camp. In the Inner Sanctum, surrounded by the Frozen Falmer. Shrine of Dibella Blessing of Dibella: +10 Speechcraft. In the wilderness, south of Old Hroldan Inn across the White River, directly adjacent to the bridge. Markarth, in the Temple of Dibella. In the top of Broken Tower Redoubt. In the tower of Morvunskar, in a room next to Naris the Wicked. South of Dawnstar, on a stone platform constructed on top of a cliff east of the road. In the corner of Lucky Lorenz's shack across the river from the Abandoned Prison. In the master bedroom of Haelga's Bunkhouse, Riften. Shrine of Julianos Blessing of Julianos: Increases your Magicka by 25 points. Inside Fellglow Keep, a little southwest of the Fellglow Keep Ritual Chamber. North of Shearpoint, after going down some cliffs. It's almost completely buried, and is marked with a skeleton. Inside Harmugstahl, in Kornalus' room. In the courtyard of Fort Amol. Disappears along with the elemental mage occupants should the fort be taken over by either side in the Civil War. Shrine of Kynareth Blessing of Kynareth: Increases your stamina by 25 points. Inside the Temple of Kynareth in the city of Whiterun. Inside Fort Sungard Shrine if the Forsworn occupy the fort. Southwest of Morthal, east of the river, between the city and Crabber's Shanty. Inside the Wreck Of The Brinehammer (on the shore, midway between the cities Dawnstar and Solitude). The shrine is lying on the floor near bookshelves. Inside Crystaldrift Cave, in the northwest corner of the main chamber. In Nightcaller Temple, on a table along the wall to the left as you enter. In the Temple of Mara in Riften. In the woods near the western border of the Pale and Whiterun (at the foot of the mountain range containing the Skyborn Altar dragon lair, in a straight line south from the Shrine of Mehrunes Dagon. Shrine of Stendarr Blessing of Stendarr: Block 10% more damage with your shield. Near the center of Whiterun Hold's tundra, south of Swindler's Den and northeast of Broken Fang Cave. In Fort Greenwall Captain's Quarters. Inside the Hall of the Vigilant. Shrine of Talos Blessing of Talos: Time between shouts is reduced 20%. In the Temple of Talos in Windhelm. On the island directly west of Winterhold and north of Saarthal. In a valley north of Alftand and west of Saarthal. On an island northwest of Winterhold and to the north of Ysgramor's Tomb. Near Windhelm, south-southwest of the city, west of Windhelm Stables on a high rock outcropping. In Riften, behind Black-Briar Manor. In Whiterun, next to the Gildergreen tree. In Markarth, inside the Shrine of Talos. Inside Fellglow Keep, on the bottom floor, between rubble and a broken altar in front of a ruined statue of Talos. East of Whiterun, a short distance southeast of Shimmermist Cave, in a shallow alcove under a rock outcropping. Also see Elisif's Tribute. Southwest of Windhelm, on a straight line between Cradlecrush Rock and Mara's Eye Pond, at the shores of a small pond, northwest of Mixwater Mill. A statue of Talos right next to it is visible from Windhelm's entry bridge. Southwest of Froki's Shack, can be reached by following a path from Froki's Shack up the mountain. Northeast of Pinewatch, apparently attacked by a Thalmor Justiciar, who will be found dead among the worshippers he slew. Inside Fort Sungard Shrine at Fort Sungard, southeast of Rorikstead. Only present if the fort is occupied by the Stormcloaks. Shrine of Zenithar Blessing of Zenithar: Prices are 10% better. Immediately west and just very slightly north of Four Skull Lookout on a promontory overlooking the river valley. Easily within sight of the western column of Four Skull Lookout. Within ruins in the wilderness between Fort Greymoor and Rorikstead, immediately east of Gjukar's Monument. West of Swindler's Den set against a large rock. There are other rocks of varying size around the area in a loose circle. Northeast of Riften Stables. Take the road north from the stables then turn east immediately after the guard towers. Look up the hillside. There's also an Amulet of Zenithar on the table. ^1The description of this blessing is misleading; the actual effect is that Restoration spells cost 10% less magicka to cast. With the Hearthfire add-on installed, you can build each of these shrines in the cellar of your house. Note that the shrine to Auriel from the Dawnguard expansion is not available as an option. For more information on Amulets of the Divines, see the Amulets of the Divines page. For more information on the Blessings, see the Blessings page. When Creation Club's Survival Mode is active, shrines outside of the player's home will cost gold to remove diseases. This page was last modified on 3 December 2018, at 15:19.